Fellow Homestead Revival Reader, Galf, sent me a link to "Field Song" by William Elliott Whitmore. How very appropriate! Thanks, Galf. What'd ya think? Pretty good, huh? 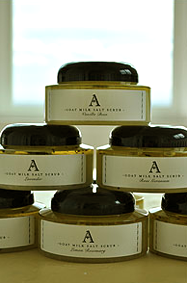 Thanks to all who visited Anderson Family Farms and participated in the give-away this past week. 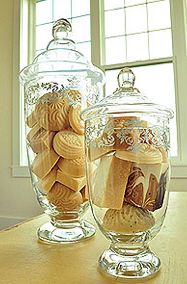 They truly have a wonderful product and a great vision! Rick and Kimberlee wanted to spread the joy, so they have 4 products they are giving away. Congratulations, to all four of you! I know you'll enjoy your new Goat Milk product. And I'm sure everyone has been blessed meeting the Anderson family, their farm, and of course, their cute Kinder goats! If you're looking for some lovely birthday or Christmas gifts for friends or family members, pampering them with some of these lovely goodies would surely be a treat. Just don't forget yourself! Good morning! It's Monday and summer is coming to a close. Well, at least in terms of school starting. So much to do with only one week left! Our camping trip was wonderful despite the yellow jacket sting I received. While I'm extremely thankful I do not have a life threatening reaction to insect stings, I have some localized reactions that are an issue. The swelling covers a huge area, it's all red and puffy, hot to the touch (localized fever), and blisters have formed. And it's not only painful, it keeps me from doing things on my To Do list! Oh, but the trip was fun! Great food, river swimming, kayaking, water rafting down the rapids, campfires, some light hiking, and best of all, the wonderful company of friends. The kids will remember this trip for a long time to come. And it was a good opportunity to practice some campfire cooking in the dutch oven. Each family took one meal and prepared it for the entire group. Mine was a Mountain Man Breakfast (so healthy! LOL!) along with tortillas. I also had a chance to go to a county fair and see the Dairy Goats being judged. It was lots of fun to see if I could place them before the judge did and then compare my results to how they actually placed. Since there were two judges and two rings, the goats were actually judged twice and you could see how different judges placed them as well. I was particularly interested in the Nigerian Dwarfs for my daughter. Perhaps we'll add one to our Kinders so she can actually show in the fair next year. Oh, and the LaManchas are always fun! This week's challenge is short and brief because I'm out camping today! However, I did get some stuff done this week. Most of you probably started school this week unless you homeschool (I always wait til after Labor Day so I can soak up every bit of summer!). So how did prepping go with your schedule change? Please only post on preparedness topics. And be sure to take the Preparedness Challenge picture and add it to your blog so others know you're participating and hopefully they'll join up, too! Please be respectful of our topic and only add a post that is preparedness related in order to retain the integrity of the link up event. THANK YOU!! I haven't actually finished watching this entire movie yet, but what I have seen of Food Matters has reinforced what I've believed for a long time: Your body is actually designed by God to heal itself (within His general will) and food makes a difference in how and if that healing will take place; generally speaking! I do believe God allows us to sometime experience an illness or disease for a specific reason and He can use it to glorify Himself, but for most of us, we're sick because of what we do to our bodies on a day in, day out basis. None of us will add years to our life because God has numbered our days before we were ever born. However, could we add life to our years? I think most of us definitely could do so. And I confess, this last year, I've let quite a bit of "junk" slip back into my diet. Watching a movie like this is an excellent reminder and great motivation! After watching the first portion, I admit that I'm not sure I agree with taking lots of vitamins, but hey, they're certainly better than lots of pharmaceuticals! You can watch the entire movie instantly on Netflix or you can view it through the Food Matters website for a nominal fee. Let me know what you think! *Due to my internet reception this weekend, comments may not post until later this weekend. However, please leave your thoughts and eventually it will show up under the comments. Thank you! We're off on another camping adventure. Roughing it without any amenities, hookups, or niceties. Just us and nature. Thankfully, it's only for two nights. I think I can manage that! I wanted to share a little about my camping notebook that I mentioned in an earlier post. I love notebooks for organizing and so naturally, putting all my paperwork in an easy to carry three ring binder made a lot of sense. My favorite item in it is a packing list that I can reuse to check off items as I get them in the camper (which we usually borrow, so it's not packed all the time, which is what I'd do if it were my own.) I downloaded a free check list from REI and then slipped it into a plastic protective sleeve that fits into a three ring binder. Then I use a wipe off type pen to make items off. When I'm all done, I just have to wipe it off with a cloth. • information on local attractions, shopping (such as a grocery store), land marks you want to see, etc. • a running list of things you want to remember to pack NEXT time, that you forgot while camping THIS time! What items would you include in a camping notebook that I didn't mention? Let's make sure we've covered everything! 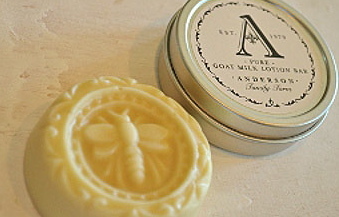 IThe minute I heard about Anderson Family Farms and their products, I knew I'd found a real treat! Rick and Kimberlee Anderson of Ellensburg, Washington turned their solution to their son's milk allergy into a family business over the course of 13 years. When Rick gave his wife a couple of Kinder goats as a birthday gift, their journey into raw milk brought healing and blessings to their family as they discovered a rural lifestyle, homemade cheeses, goat milk lattes, soaps, and eventually, an entire line of products. I'm going to have to treat myself to this stuff a lot more often! I loved that the Goat Milk Lotion was loaded with additional goodies like aloe vera, jojoba oil, olive oil, shea butter, coconut oil, and vitamin E... it's got everything going for it. (I'm really looking forward to using it this winter when the climate is really dry around here!) I put some on my legs before church last week and I kept getting a pleasant whiff of vanilla bean all throughout the day - not over powering, but just a light fragrance. Such a treat!! 2. Subscribe to Kimberlee's blog, Goats For God's Glory, "like" their facebook page, or follow their tweets and you can leave me another comment telling me you've done one of these and you'll be entered again. (If you do all three, please leave three more comments; one for each). This give-away will end Saturday, August 27, 2011 at 11:59 p.m. PST. I have not been compensated to review this product line other than receiving a sampling to try. My reviews are solely based on my own opinions and experiences. 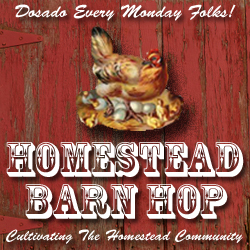 I realize there are men that read Homestead Revival™, but may I take a day to specifically address not only my daughters, but our female readers on the topic of femininity? (Guys, you're more than welcome to post your comments on this topic as well). Ladies, this topic has come up in my own home, especially as of late, and I felt that I wasn't communicating my thoughts to my own daughters very clearly or graciously. Writing it out has helped me tremendously and it reflects my own interpretation of scripture. Perhaps it is a discussion in some of your own homes as well. If so, I hope it helps. Also, I pray that everyone (including my daughters) will remember that this is how we should be characterized; none of us will probably ever do this perfectly 365 days a year, myself included! 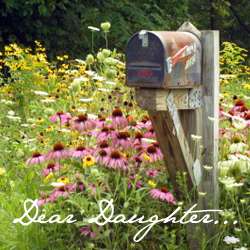 As you already know, having a house full of daughters, it's easy for our home to become a "girl world". And yet, living miles outside of town where a knock on the door is rare, it's also easy to become very relaxed in our day to day living, specifically in our appearance. But really, any excuse is as good as any when you're homesteading and maybe tired, working out in the yard or the chicken coop, gardening in the dirt, canning in a hot kitchen.... you get the idea. Soon, we have swapped out the nice clean shirt for one with paint and a hole (daily instead of when we're actually painting), we skip the makeup for the day, decide we'll wash (or brush!) our hair later, and tell ourselves no one will see us. Our family does. And our men do! And before you know it... we're characterized by looking haggered, tired, and overall... unattractive. First, whether we wear jeans and cowboy boots, a skirt and head covering, capris and a t-shirt, it's important that we look like a lady! Don't just take my word on this. Look to God's Word for direction on the subject... while you may interpret Deuteronomy 22:5 differently, at the very minimum, we can agree that a man was to look like a man and a woman was to look like a woman. “A woman shall not wear man’s clothing, nor shall a man put on a woman’s clothing; for whoever does these things is an abomination to the LORD your God." We need to seriously consider what God desires for women to do when it comes to being feminine. There is the minimum expectation and then there are things we can do that might enhance our femininity even further, without being legalistic, specifically things that please our husbands that are not forbidden by scripture. "But all things must be done properly and in an orderly manner." I Cor. 14:39. This verse may be speaking about prophesying in tongues, but in general, it's speaking about how we conduct ourselves... period. God would not have us orderly in our speech, but disheveled in our appearance, would He? God took great care to place your eyes, nose, and mouth in an orderly arrangement that has not varied from person to person... so apparently, He has shown us that a systematic display of facial features is important. Taking care to maintain ourselves is not just "acceptable", it's a statement that we recognize God's desire for us to be orderly as well. Brushing our hair, arranging it in a pleasing manner, and keeping our bodies clean are all ways we reflect His order. Even things like neatly trimmed or manicured nails, ironing a skirt, or making sure the blouse has all the buttons sewn in place communicates our submission to His will. And when we do it with joy, it pleases our Heavenly Father. And finally, what about God's character in terms of beauty? While we may not always feel beautiful, shouldn't we try to reflect all His character at all times, including beauty? I'll be the first to agree that we should not spend more time on our outward beauty than our inner beauty. Proverbs 31:30 warns us specifically of a woman who only relies on her outward beauty, but this warning was not a command to purposefully make ourselves ugly; nor was it a license to neglect our appearance and let ourselves go. There is no biblical requirement for us to wear costly clothing. But I hope you can see there is a call to look like a lady, as well as to be clean, neat, and as attractive as possible given the context of the moment. Doing hard work should not be an excuse, nor should the fact that we think no one else will see, because we never know what the day will hold and who may grace our doorstep! And our husbands and family? Do they not deserve our very best? Who else should we want to please the most other than our Lord? How we walk, our speech, our manners at the table... all contribute to our appearance. A young lady who laughs so loud as to drown out others, chews her food with an open mouth, or talks incessantly about herself or anything else, for that matter, detracts from any physical beauty she may naturally possess. Rather than drawing people to her, she ends up pushing them away. God made you to be a woman for His pleasure and His glory; it's an opportunity to reflect the beauty of the Lord within you. Don't miss out on the blessing you've been given! And don't miss this moment in time to bless those around you. Here we go again, friends! 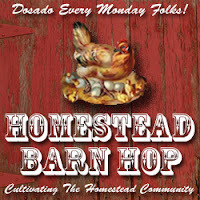 Monday is Homestead Barn Hop day! Yahoo!! I'm working fast and furious to get the goats here, but most of it is still in the planning stages. Nothing yet to even show in a photo. (I could use some prayer that things fall into place so I can bring them here in about a week or so!) Turns out, I may be bringing 3 home! Woo hoo!! This past week, most of our time was devoted to just getting my daughter and catching up with her on all the details of her trip. And now that she's back, we're working on getting several projects done before I start homeschooling next month and she starts on-line college. We began painting the entry hall which was way over due after a remodel in the hallway that required the entry to be repainted. I plan to put bead board up as well, but that may take some time. Then the fall garden needs to be planted this week, so that's on the agenda, as well as packing for another camping trip. It looks perfect in my farmhouse style kitchen! I'm going to enjoy this immensely for entertaining, but it's going to give me a lot of pleasure just looking at it every day as well. Thank you, Delores! I'm thrilled to have won this! "Wow! Pick me!!!! ;) I only had time to give that page a quick scan but I can tell that is one DVD I need to watch. I'm very, very new to this self sufficiency thing and am trying to learn everything I can; it looks like this is a video that would go a long way in educating me on the particulars of the process and lifestyle. And I am definitely a visual learner also so that's another reason this would be super. :) "
Elizabeth, I have your email address and I'll be in touch. Congratulations! 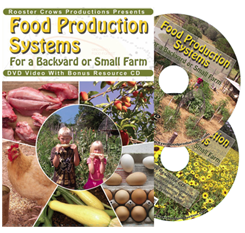 Thanks to all who participated and spent the time visiting Back Yard Food Production's website. Those who signed up for the newsletter will be getting some great information. I hope you'll consider this resource in the future as it is truly a one-of-a-kind! And they said, "Jesus the Nazarene." "I told you that I am He..."
... He is not far from each one of us... "